I think I know what a song title on the next album of Sinead O'Connor will be. See if you can figure that one out also. 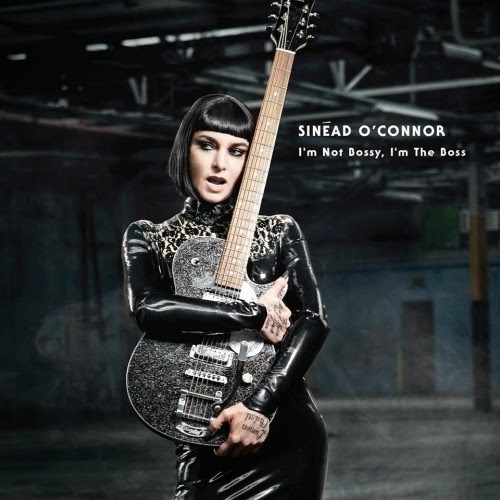 On the cover of her new album Sinead looks like Joan Jett in her The Runaways period. Don't expect any girl punk though. Looking that way and sounding that way are two very different things. The self-assured rock chick look, doesn't match the mood and lyrics of I'm not bossy, I'm the boss. Just like the self-certified boss doesn't appear so bossy either. Not all is well in the world of Sinead O'Connor. The results are the better for it as I'm not bossy... is a fine album. Two and a half year ago Sinead O'Connor surprised me with her album 'How about I be me and you be you' (http://wonomagazine.blogspot.nl/2012/03/how-about-i-be-me-and-you-be-you-sinead.html). The first album by her I listened to since 1990. I can't remember why I decided to listen to the album, but I haven't regretted it for one second. The same goes for I'm not bossy... The mix of stout ballads and polite rockers have the exact right tone and mood to like instantly. The ultimate intenseness of 'The lion and the cobra' has disappeared and the ultimate sadness of 'Nothing compares 2U' has made room for the sort of wisdom and resignedness that comes with living. The album starts with a straight reference to 'Nothing compares 2U' though. The keyboard sound in the background echoes the soundscapes of O'Connor's greatest hit. Comparisons stop there as a drum kicks in and makes 'How about I be me' come alive. The beauty remains though. It's a song about love, but also hurt and insecurity. Longing for something that may not be within reach right now. Sinead O'Connor sings it with the right voice, the right tone and the instruments behind her do everything right to make this song a huge success. In 1992 it would have been the right song to continue her career with. In 2014 I'm very glad to be able to enjoy it. 'Dense water deeper down' gives everyone listening to the song the opportunity to enjoy Sinead while being made love to. Is there something like aural voyeurism? Auraeurism? On the other hand it's on display, so it's not secret is it? No avoiding it except to skip the song. For that it is to good. Like the more up tempo 'Kisses like mine' is. Convincing this song is, again. O'Connor seems to have found a new muse and the right persons to write songs with, like producer John Reynolds and lead guitarist Graham Kearns. Together they create the circumstances in which O'Connor is able to do what she is good at: singing in a great way on the turnpike of indierock, pop and rock with a dash of mystical Irish folk. The freedom these styles allow her ranges from the almost bluesrock of the fine rocking 'The voice of my doctor' all the way to the ethereal 'Streetcars'. With in between the soft starting, hard ending 'Harbour'. On I'm not bossy... Sinead is able to take different side roads, but all lead to a great song. Even better than on her two first albums and on her previous album. Slowly but surely I'm starting to realise that I'm not bossy.., may well be the best album she released to date. She even gets away with a James Brown pastiche, called 'James Brown'. Including some sax playing by Seun Kuti. So now we have two songs from Ireland called 'Take me to church' within a few months. Both very much interesting to listen to. (There may follow a review of Hozier's album in the coming weeks. Still deciding on it.) A bit inconsistent this 'Take me to church' is lyrically though. After a couple of love songs singing "What have I been writing love songs for? I don't want to sing them any more"? Forgiven as this song and the love songs are as good as they are on this album. Having listened more often to I'm not bossy, I'm the boss I start to realise why this album appeals to me more than any of Sinead O'Connor's previous records. The balance in music is much better, but also she herself seems to be just this little less angry, which makes it not only easier to listen to her, but also seems to bring out her strengths so much better. Distributed in the right dosages everything comes out better. With age comes wisdom? It very much seems like it, judging this fine, fine record. De verleiding van Prismes van Peppermoon was in mijn geval direct meedogenloos, maar de echte liefde voor de plaat moest toen nog groeien. 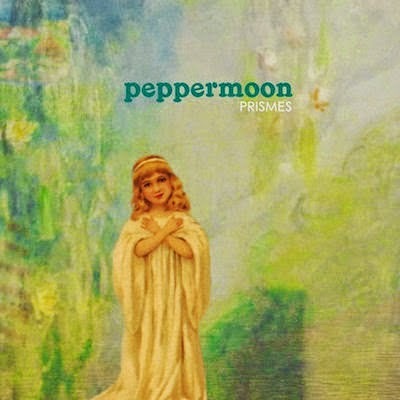 Inmiddels ben ik zo verknocht aan Prismes van Peppermoon dat ik niet meer zonder wil. Niets is lekkerder wakker worden, niets is lekkerder slapen gaan en ook hier tussenin zorgen Pierre Faa en Iris Koshlev steeds weer voor het zo nodige moment van rust en ontspanning. Ik heb dit jaar in plaats van een flinke stapel maar één Frans plaatje in handen, maar ik ben er nog nooit zo blij mee geweest. 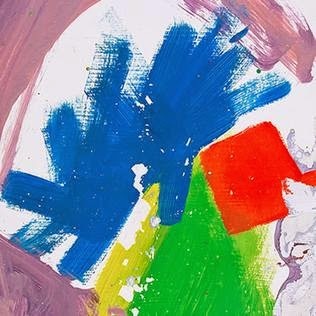 Early 2013 I finally submitted a review of Alt-J's debut album, simply because I couldn't make sausage of the album, because I couldn't hear why every single reviewer was raving about the album and the then so called critics put the album firmly on the number one spot of 2012's best album charts. So I challenged myself and wrote about what I did hear. 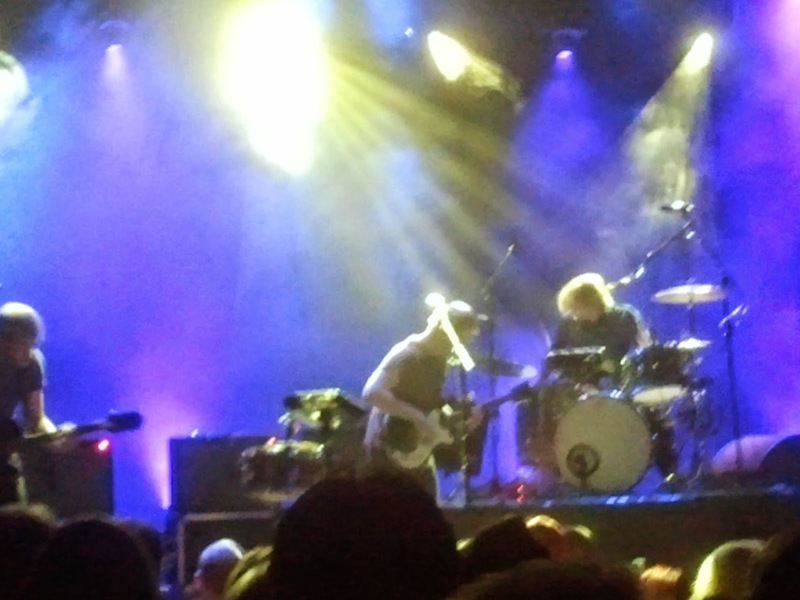 (Read more here: http://wonomagazine.blogspot.nl/2013/02/an-awesome-wave-alt-j.html). Surprise, surprise, come 2014 and here I'm writing on This is all yours totally voluntary and the pleasure is all mine. Yes, a lot of weird things are going on on this album too, none the less this is fun to listen to and doesn't repel me in any way as 'An awful wave' did for most of the time. Perhaps everything is explained as easily as bass player Gwil Sainsbury quitting the band before recording the new album. Who knows, I'll never know, won't I? Fact is that, despite that the cover again is quite abstract and colourful, the colours are a lot brighter this time around. Another hint at the content? The music on This is all yours again is experimental. There's no easy way into this album. Sounds are at times fragmentary, songs cut ups, non free-flowing pieces of music, it's all there again. But a soon as I've written this, I have to admit that This is all yours puts me on the wrong foot the whole time. The odd 'Intro' is followed by the nearly classical music of 'Arrival in Nara'. The sparse piano, the just as sparse guitar notes and a plucked bass. Somehow a hint (suggestion even?) of a brushed snare drum. A song so slow, that it seems to go on for ever. There's even singing after a "long" silence. Nostalgic beauty, that is what 'Arrival in Nara' is, nothing I associated with Alt-J nor ever expected from this band that somehow promised to make a career out of musical prickly pears. 'Nara' is less nostalgic, but a surprisingly warm song. ("Love is the warmest colour" is a part of the lyrics.) Also a quality I did not associate Alt-J with. More distance and stand-offish, to be precise. 'Left hand free' is a totally odd one out. A bit of a rocker, like they produced in the 70s. With this lazy guitar riff. To make it somehow more contemporary, the vocals get a bit of a treatment, sounding almost gnarly. To compensate the listener is treated to a class of kids blowing a wooden flute. Why not? Speaking of odd ones out! 'Garden of England' is a bit weird if I'm honest and still it works in this context. That is the really weird thing about This is all yours. Totally rustic U.K. country side, rural England on flute. 'Choice kingdom' also has to do with Britannia. Again this song is rest itself. As if Alt-J is demonstrating through its music: There is no pressure on us with this second album. The band certainly dare to take its audience everywhere that it wants it to go. Just follow, you won't be disappointed, is the invitation of the band. I just did; surrendered. 'Hunger of the pine' lends some from 'O Superman', Laurie Anderson's only hitsingle and some from Miley Cyrus and why not? The sample works in the song. Both parts are just a start for the song, that builds wider and broader and becomes more interesting by the second. Alt-J surely has listened to The National as well. The wideness of a song and the seriousness mix here in a familiar way. Taking the whole album in, This is all yours may surprise less then 'An awesome wave', but to me is more consistent or I've gotten used to Alt-J, but either of the two. At this point in time I can't be called an Alt-J fan yet, but this is a step in the right direction as far as I'm concerned. The band has found a middle ground between experiment and songs. 'Warm foothills' is such an example. Cut up technique in the alternated vocals, warm glowing music. A warm version of Radiohead at its most extreme. Something like that. 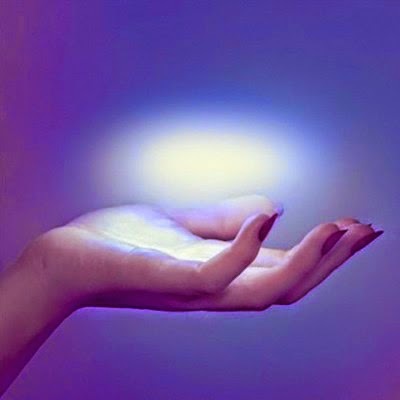 This is all yours can be called a lot, but not an easy album. It is hard work to sift through all the ideas that went into it. The different styles and different approaches make the album hard to decipher. By taking your time it is possible to warm to the album. Something that 'An awesome wave' never managed to do with me. 'This is all yours' may just do so over time. With an invitation like the one Alt-J presents to the world, it is kind of hard to resist trying, isn't it? I just love surprises. Cream passed me by in 1966-1968. When 'White room' hit the charts in the autumn of 1968 the band had already decided to break up. I can't remember hearing any of the band's other, minor, hits on the radio those days. The impact came a few years later, when a friend had 'I feel free' as a single. Other songs followed through the years. 'White room' always remained my favourite song, followed by 'Sunshine of your love' and 'I feel free'. Of the album songs 'Badge' is another. Getting to learn the band better in the early 1980's, I found that the experimental songs and the endless live jam sessions were not for me. Only about 50% of the band's output is really of interest, in my opinion. 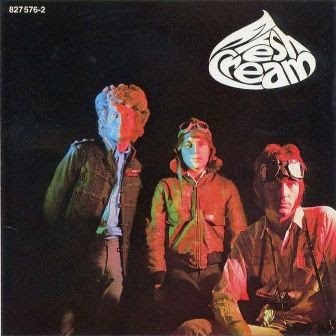 Cream was around for only three years, but had a large impact on everything what happened after it. It set a standard in playing in a trio setting, also on Jimi Hendrix, and on experimentation in rock. Jack Bruce was the voice, songwriter (with lyricist Pete Brown) and middle of everything going on around him. Drummer Ginger Baker and guitarist Eric Clapton went off in any direction they could while the bass kept things together, while at the same time being played like a lead instrument itself half and more of the time. The band imploded due to the clash of characters. Eric Clapton soon became the main man he is to this day (and already was before joining Cream: Clapton = God could be read on London walls). Jack Bruce went back into semi-obscurity, being the jazz influenced musician he was. Exploring jazz rock on many albums that I all do not know to this day. So was his life a life unfulfilled when we look at his talents or has he made the most of it? I can't tell you that of course. Fact is he slowly went back to being a more obscure musician. Tucked far away in Clapton's shadow. Circa 1980 he stepped back to the front for me for a very short while. I can't recall the right sequence correctly anymore, but it could have gone like this. The twice yearly Rock Palace nights from the Grugahalle in Essen were a phenomenon in those days. On one of these nights Jack Bruce & Friends played. A fantastic set of jazzy rock songs with just enough pop to make them extremely listenable. I bought the album and in late spring drove to the Lochem Festival with a couple of friends to watch him play there. After that Jack Bruce went back to his place in the music pantheon: unnoticed. The DVD of the Cream reunion shows in London was his final return for me. Already "old" and in semi-good health, seated for half of the show, Jack Bruce showed once more what a fabulous bass player he was. His vocal powers had clearly dwindled by then, but still very characteristic. This year an album was released. I listened to it once and couldn't really hear anything very exciting there. From this spot I'll promise to make amends and listen once more and more attentively. Should the album be worth reviewing, I will as a final salute to an exceptional musician. They Want My Soul is al met al een mooie en waardevolle aanvulling op het al zo indrukwekkende oeuvre van Spoon. Iedereen die dit oeuvre kent weet inmiddels dat They Want My Soul in de categorie ‘verplichte aanschaf’ valt. Peace and quiet is the reflection that is presented to us on the cover of Passerby. Woman and cat fully and contentedly asleep. From the look of it an afternoon or early evening nap, with the cat snuggling up. The cover suits Passerby perfectly. Most of the music is just as restfull and relaxing as this cover is. Luluc is an Australian duo consisting of Zoë Randell and Steve Hassett. Although the duo mainly operates from the United States at present. In 2008 Luluc's first album, 'Dear Hamlyn' saw the light. It got Luluc some grassroot following in its home country. 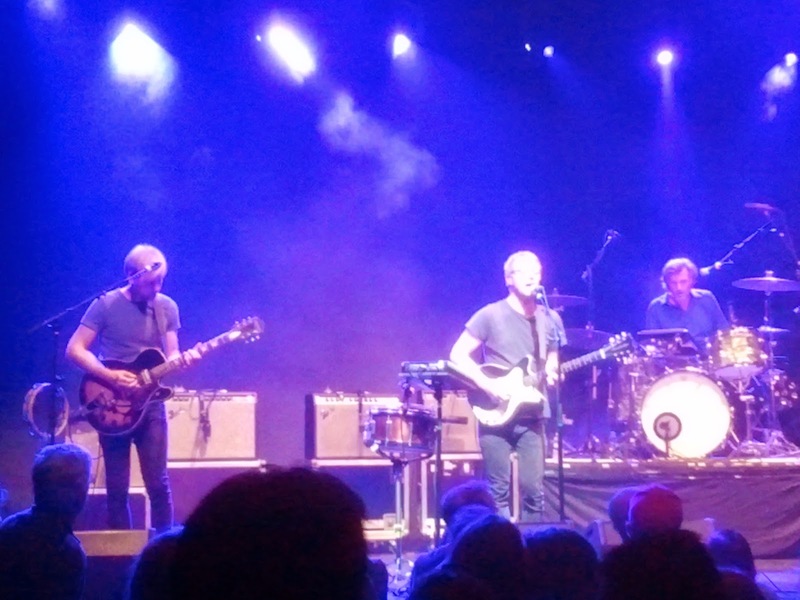 After six years there is a follow up, produced by The National's Aaron Dessner. Another sure sign of the influence this band has on the current music landscape. Dessner's production at times is almost non-existent, while at the same time there is a lot going on on Passerby. The sound is as if Zoe Randell is singing in the front of a large hall. Her voice is always up front, no matter what else is happening. The rest of the accompaniment is somewhere behind her in this large hall. Some instruments are placed so far at the back, that they are barely discernible in the sound at all. This explains on the one hand the restful atmosphere as on the other the under the skin sort of tensions that invade Passerby every once and again. Zoe Randell at all times is at ease it seems. She is cool, calm and collected in her vocal expression. Sometimes supported by a male vocal in, the background of course or she sings a second or third vocal herself. Mixed 100% behind her, so that there is no interruption of any kind to her vocal expression. I can't call them harmonies, as they are all but that. 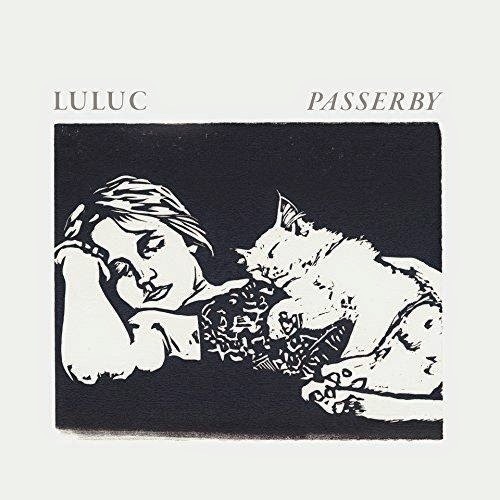 The music of Luluc goes under the moniker indie-folk. I can live with that. There are some references to Nick Drake, Sandy Denny (or Fairport Convention). It is even possible to hear some subdued 'All around my hat' references in Passerby, but in the end these references are all too easy. Randell and Hassett have created their own universe. If anything, the album reminds me most of Gretchen Lohse's debut album 'Primal rumble' (http://wonomagazine.blogspot.nl/2014/02/primal-rumble-gretchen-lohse.html). Although her songs are a little more alternative and idiosyncratic, with a producer like Aaron Dessner she may well come close to what's on display on Passerby. A song like 'Without a face' comes so close to Lohse's songs. The difference is Dessner. He manages to present most songs on Passerby with these extras, that make me prick up my ears, sometimes even to strain them to find out what is going on there in the back of this large hall. Things remain totally subdued, except once at the end of 'Tangled heart'. All of a sudden the horns are unleashed for a few moments, a range of notes. The moment that Randell sang all there was to tell. Creating this uncharacteristic moment on Passerby. Passerby is not an album for all seasons. For that it is to quiet, to subdued. For the moments that music like that is called for, Passerby is an album that may just fulfil all your needs for quiet, beautiful music. 'She's got a secret' is the best farewell song Moss has. "A sea of noise", as my girlfriend described it, washed over us. With the bass guitar as the lead instrument, playing that fantastic riff. It should have been the very last song and not the ending before the encores. The song has it all. Power, mystery, drive and that typical Moss beat. Let me come back to that later. It's too bad that I did not start shooting photographs before the show. That would have given me the opportunity to show you the Moss group sweater. I'm afraid that it won't be a hit like Sophie Lund's Nordic sweater, but you never know. Someone has to set a trend. Let me grump just a little, before I go into the review itself. What is it with announced starting times at pop venues? It starts at 20.00 and one evening nothing happens until 20.45 or even 21.15. Yesterday we were there around 20.45 and the support act had already left the stage, with Moss staging its stuff. Sorry Alamo Race Track, no review. Moss is touring after it's fourth album. As I wrote on this blog (http://wonomagazine.blogspot.nl/2014/03/we-both-know-rest-is-noise-moss.html), in my opinion it's Moss' best to date. Unfortunately this did not show in attendance figures. There being circa half a year between the release and this tour perhaps explains why the venue was not a sell out. (Lucky for us, as we were able to get tickets at a late stage.) Listening to Moss play live, it's a mystery to me. This band is really good. On the basis of its four albums it was hard for me to predict what to expect. On record Moss' music is sometimes hard to digest for me. The sort of music I have to be in the mood for, but always recognising the quality of and appreciating the experiment behind the songs. The band was on my list to go to. I'm still not sure whether I saw Moss or Do the Undo supporting Johan in Haarlem circa 2007-8. Even it was Moss, the band cannot be compared to the band it was then at the time of the release of its first album. At the time of 'Ornaments' (http://wonomagazine.blogspot.nl/2012/04/ornaments-moss.html), album number three, the band went more into what I call none-songs, songs that are stripped of essentials and are more and more serene moods. 'We both know the rest is noise' is aptly titled as Moss found the correct mix between atmosphere and songs and, yes, noise. How does that all translate to the stage? As a mean rocking machine. As a band that is able to work with dynamics within songs to an extreme. As a sound that rolls over you like the sea, shakes you around a bit, retracts and let's you loose again, just before it gets life threatening. Just like the sea is capable of. And on top of all that: that Moss beat. Not one songs seems to have a straight forward rock rhythm. That makes Moss songs harder to digest for the general audience, but the more interesting, without going as far out as e.g. a band like Zita Swoon or De Kift. Most of the time melodies remain free flowing over the rhythms and sounds. The trick is that the rhythm often goes into double time, setting the song off on a rock course and the audience into dancing mode. Perhaps that was the biggest surprise to me, that a lot of Moss' songs are so danceable (and played a little faster than on record). The result is Moss, the rock machine. 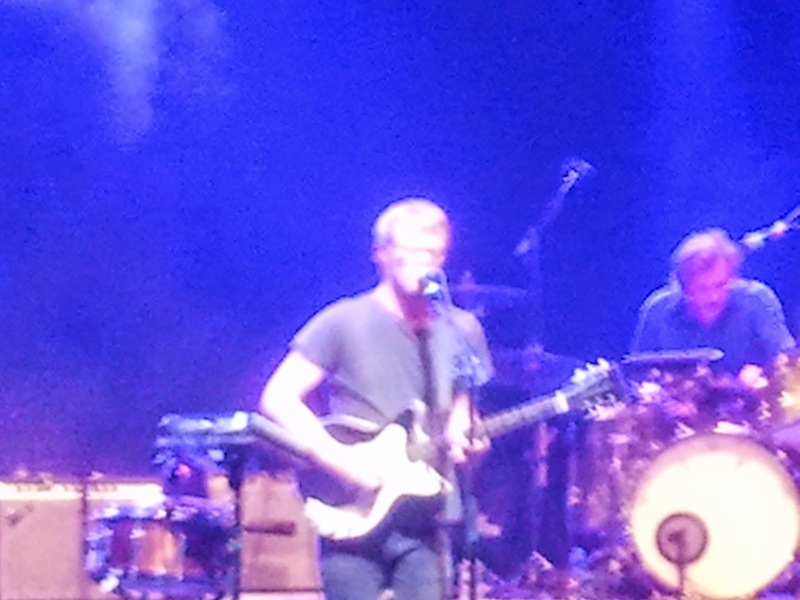 Another extremely pleasant factor is that all four band members sing, making great harmonies together. Including counter melodies and all in 'Unilove' e.g.. Frontman Marien Dorleijn has a rather high voice, that suits this music fine. The support of the three band members make it special. Singing even higher at times. Concluding I can say that I had expected a good show, but where I expected a serious, somewhat subdued show, I was surprised by how hard this band can rock at all the right times. The long instrumental interlude convinced, the subtle lightshow, minus 'She's got a secret''s stroboscope, finished it all off nicely. Moss presented me with one of the best shows I saw this year to date. Recentelijk verscheen het nieuwe plaatwerk van van vader en zoon Cohen. Dit feit zetten we twee dagen centraal met de recensies van Erwin Zijleman. Gisteren Adam, vandaag Leonard Cohen. Leonard Cohen vierde recentelijk zijn 80e verjaardag, maar zijn hoge leeftijd weerhoudt hem er niet van opnieuw een nieuwe plaat uit te brengen. Deze nieuwe plaat volgt op een jarenlange, buitengewoon indrukwekkende, tour, die hem vorig jaar nog twee keer naar Nederland bracht, en is de opvolger van het in 2012 nog als slotakkoord aangekondigde Old Ideas. 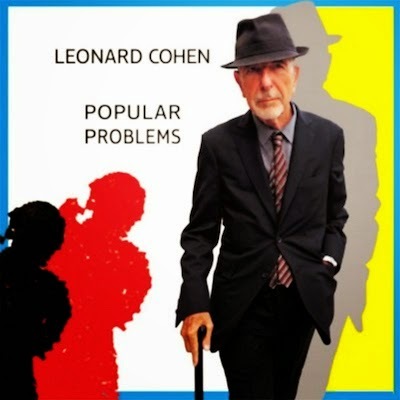 Leonard Cohen heeft met Popular Problems al met al een plaat gemaakt die er echt toe doet. Er zijn heel wat jongere muzikanten van naam en faam die dat al heel lang niet meer gelukt is, wat Popular Problems alleen maar meer glans geeft. Popular Problems bevat een aantal hele mooie songs die op fascinerend gedreven wijze worden vertolkt door de man die van geen ophouden wil weten. Een diepe buiging is op zijn plaats. Recentelijk verscheen het nieuwe plaatwerk van van vader en zoon Cohen. Dit feit zetten we twee dagen centraal met de recensies van Erwin Zijleman. 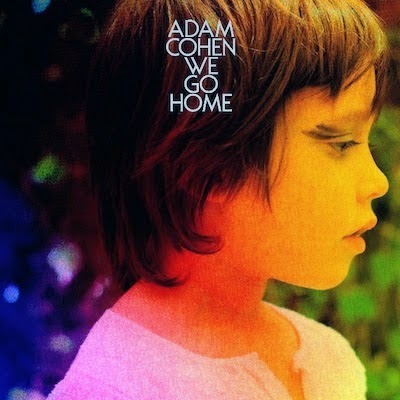 Vandaag Adam Cohen. Tegen zijn vader moet Adam Cohen het waarschijnlijk nog steeds afleggen (maar dat weten we moregen als ik de nieuwe plaat van de oude meester recenseer), maar de concurrentie met de meeste van zijn soort- en tijdgenoten kan Adam Cohen met gemak aan. We Go Home is een bijzonder knappe en betoverende plaat en waarschijnlijk groeit hij nog wel even door ook. Ik durf het best een prestatie van formaat te noemen. One of the first reviews on this blog was The Parlor Soldiers' first and only album, followed by an interview with Alex Culbreth. 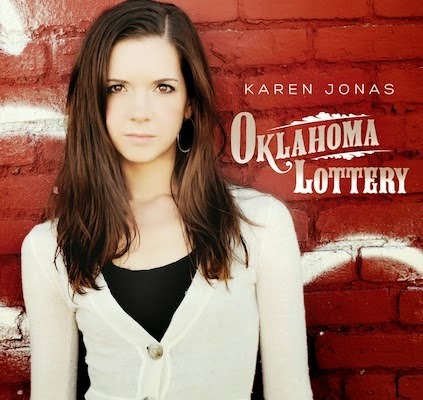 This summer we ran two different reviews of 'Oklahoma lottery', Karen Jonas' debut album. Two reviews full of praises. We thought it a good idea to let her have the word this time around and find out more about the (making of the) album and Karen herself. Not all readers of this blog may have heard of Karen Jonas. How would you like to introduce yourself? Nice to meet you all! I’m a singer songwriter from Fredericksburg, Virginia. I want to thank you all for giving a listen to my new record Oklahoma Lottery. We released the album in March and we’ve been growing with it ever since. It’s a pleasure and an honor to share my music with you. This summer and fall you’re bound on a tight tour schedule. How is the tour going so far? We’ve had a busy few months! 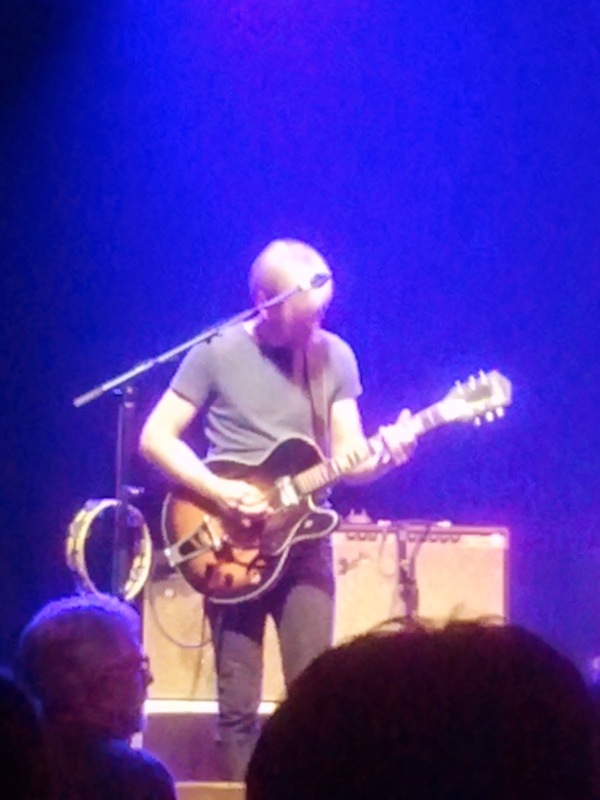 Tim Bray, the guitarist featured on the record, and I have been playing 3 and 4 nights a week since the release. It’s really exciting to see the momentum building. We enjoy our travels, Tim drives and I’m in charge of the radio and taking naps. It’s a lot of fun, just ask Tim! Oklahoma lottery is your first solo album. How did you feel when you were able to share the album physically and online? It’s an amazing experience to watch songs go from little sparks of ideas to a cohesive album. There are a million moving parts and variables that go into every step along the way, the record is the product of an infinite number of tiny decisions. I am really proud to share this record, and I’m thrilled by the impact its making on listeners. We’ve also pressed LPs for the vinyl enthusiasts out there. I love the way we have to focus on listening to LPs. You can put your iTunes on shuffle and listen for days, but the LP you have to pay attention and listen and flip it when it wants flipping. It’s an aesthetic experience. I read somewhere that you recorded Oklahoma lottery in two days. It’s sort of unbelievable as this album sounds so tight and loose at the same time. Pray explain. We recorded in two days, live at Wally Cleaver’s Recording Studio right here in Fredericksburg. It was a whirlwind experience, we were very focused. The live experience adds a lot of grit and authenticity that can’t be replicated. I think it was a gamble, and there are some spots that could have used another few minutes of attention, but the record is cohesive and genuine. Oklahoma Lottery is a song I wrote about the Dust Bowl, a historic moment in the United States in the 1930’s when a series of droughts and dust storms ravaged the plains. Farmers were forced to abandon their homes and fields and seek out a better life elsewhere. Oklahoma Lottery is a term that I invented to describe suffering and uncertainty of the affected people: “I’m sorry we’re losing the Oklahoma Lottery we’re praying on our knees, there’s no work to be done until the rain starts to fall so you pack up your old jalopy.” When I wrote the song I was having a hard time myself, my marriage had recently dissolved and I was forced to find a new place to live for myself and my two kids. I could feel the struggles of people who were leaving home, trying to find hope in a hard situation. Oklahoma lottery received quite some praises. Were you surprised, “coming out of the blue”, as some people wrote? I am so grateful to all of the reviewers who appreciated the record and spread the word. They’ve been instrumental in the growth of our fan base. We’re entirely independent, so we rely on reviews, live shows, our own networks and the internet to help us spread the word about the album. There isn’t really time to be surprised, we just keep moving forward! The album in a very general way can be called a country album. Listening more carefully many different styles come forward. Who influenced you most while composing the album? I learned to appreciate the art of songwriting from my personal favorites, Leonard Cohen and Joni Mitchell. I have picked up some country influence since then, from Johnny Cash, Hank Williams, and current artists like Justin Townes Earle, Jason Isbell, and Gillian Welch. Mostly my writing follows its own guide, each song dictates its own form. All of my experiences influence my songwriting, including listening to other artists, but each song is unique and genuine. Does a song when it comes to you dictate the form it takes later on? Yes, I usually write songs in one sitting, guitar in hand. The musicians I work with aim to support the song. As we play them live, the dynamics and inflections evolve and cement, but everything aims back to the mood of the song as it was written. The guitar is your instrument. What is your story on starting out on guitar? Several lyrics to the songs are stories, others seem, at least from this distance, personal. What influences you in writing? It’s true that I have two style of writing: for songs like Oklahoma Lottery and Suicide Sal I did some research about a topic and tried to really inhabit the characters and write from their perspective. Songs like Thinkin of You Again and The River Song are written from my own perspective. I like to think I am able to write in both styles compellingly. Two titles stand out. ‘Get out of my head’ and ‘Thinking of you again’. They are sort of contrary, aren’t they? Do they look at two different periods? It’s funny that you mention that, because those songs are written about the same person! I wrote Get Out of My Head before we started dating and Thinkin of You Again shortly after we broke up. I like to look at things from a lot of different angles. If I’m feeling really inspired about something I can write three songs in three days and they’re each completely different. Songwriting is an amazing way to process information and understand different points of view. Several songs are about hardships in life. Where does this topic come from? I’ve had my own share of tough times, and I’m pretty intuitive to the struggles of others. Music is one of the ways we have as a culture to talk about our personal struggles, to feel connected in our hardships. I think that’s really powerful and I don’t shy away from highlighting hard moments. When you’re not playing a guitar, what do you like to do best? I have two daughters that I spend a lot of time with when I’m not playing shows. They keep me grounded and directed. You were part of The Parlor Soldiers. What happened to the duo? They say all good things must end, and we met a pretty quick end for personal circumstances. I enjoyed playing music in that band and learned a lot from the experience. Maybe I even wrote a couple of songs about it. What would you say is the main difference for you between the two records? The Parlor Soldiers was a joint effort, Alex and I split responsibilities and decision making equally. So while I had half of the artistic control, that’s nothing compared to having complete freedom to take a song and an album exactly where you want it to go. Oklahoma Lottery is my songs, my voice, and my vision. I’m proud of that. Was The parlor Soldiers album in any way an inspiration to you in the years that followed? The Parlor Soldiers album was a big step in my own understanding of what I can accomplish. Our success inspired me to move forward with my own journey. What are the chances of hearing you play in The Netherlands any time soon? I’d love to travel to The Netherlands, we don’t have anything scheduled right now but we’d be happy to make a trip when the time is right. Y’all seem to have excellent taste in music. When was it? Quite some years back when The Walkabouts were still touring regularly and played the Melkweg in Amsterdam. Support act was a singer-songwriter who had just started to grow attention with her album 'Drag queens and limousines'. In the back, next to me, stood a gentlemen who was accompanying Ms. Gauthier as if he was teaching her how to play guitar: "Well done, Mary". When she played an apparently difficult chord change he was muttering approvingly to himself, when something was just a bit more challenging, he was shaking his head muttering, "Come on, Mary, you can do better". In total concentration he was following her every move as if on stage with her. The show did not totally appeal to me. Just a bit too country for me. The same went for the next album, so somewhere in the 00s Mary Gauthier faded from memory, until I read Erwin Zijleman's review of Trouble & love (see here: http://wonomagazine.blogspot.nl/2014/07/trouble-love-mary-gauthier.html) which enticed me to give her music another try and I have to say that I'm not disappointed. No matter how many singer-songwriters and folk artists' praises have been sung here on this blog, it remains an incredible fine line whether I like such an album or not. And it's almost impossible to explain the difference in appreciation. The easiest is the traditional country, that is nearly all out. The fun starts when other influences are let in. Some blues, some folk or even rock. After that the voice has to appeal and a good melody or interweaving playing and/or singing can finish things off. Mary Gauthier delivers just that on Trouble & love. She starts the album with 'When a woman goes cold'. A song Lucinda Williams would have been happy with on her forthcoming album. Just to name another artist with whom I have a frail relationship. 'When a woman goes cold' has this bite that underscores the title and is a real opening statement. How diverse Trouble & love is is shown by 'Oh soul'. This quiet acoustic song with a few beautiful guitar lines in there is nothing but a country gospel song. Sparsely arranged, no exuberance. Don't think the Edwin Hawkins Singers, but so to say just Edwin (i.e. Darrell Scott in the song) and his two favourites, that's all. Enough to make an enormous impression. The same goes for 'Worthy'. There are parts of this song that I would love to hear Mick Jagger sing (with Mary Gauthier). This is the sort of ballad that the Rolling Stones would have made a whopper with on 'Exile on Main Street', the likes of 'Loving cup' and 'Sweet Virginia'. Talking country my praises can't go beyond these two songs I'm afraid and I've just given it, no doubt. That was my real exposure to country back in 197x something. 'Worthy' is such a song. So Trouble & love reminds me of albums by Lucinda Williams, with one difference, I don't sit out a single of Ms. Williams albums. It's her individual songs I like best. Perhaps lucky for me Trouble & love is only 8 songs long (short). No problem sitting this album out. That is also thanks to the people accompanying her. Hail Jimmy Wallace (piano), Guthrie Trapp (guitar), Viktor Krauss (bass) and Lynn Williams (drums). Also worth mentioning is that Duane Eddy is responsible for beautiful solo in ('How you learn to live alone'). Trouble & love (love & trouble) is an album that goes through the end of a relationship and is pretty dark on the inside at times. It ends on a more positive note, although in a slow almost insecure way. 'Another train' is a beautiful song. It touches all the right strings to make an unbelievable impression. When the song is over there remains only one thing to do: put on Trouble & love again. It's best to end the album somewhere in the middle, believe me. So to end my review. Perhaps the world thinks that 'Drag queens and limousines' is Mary Gauthier's best album. Well it's not. 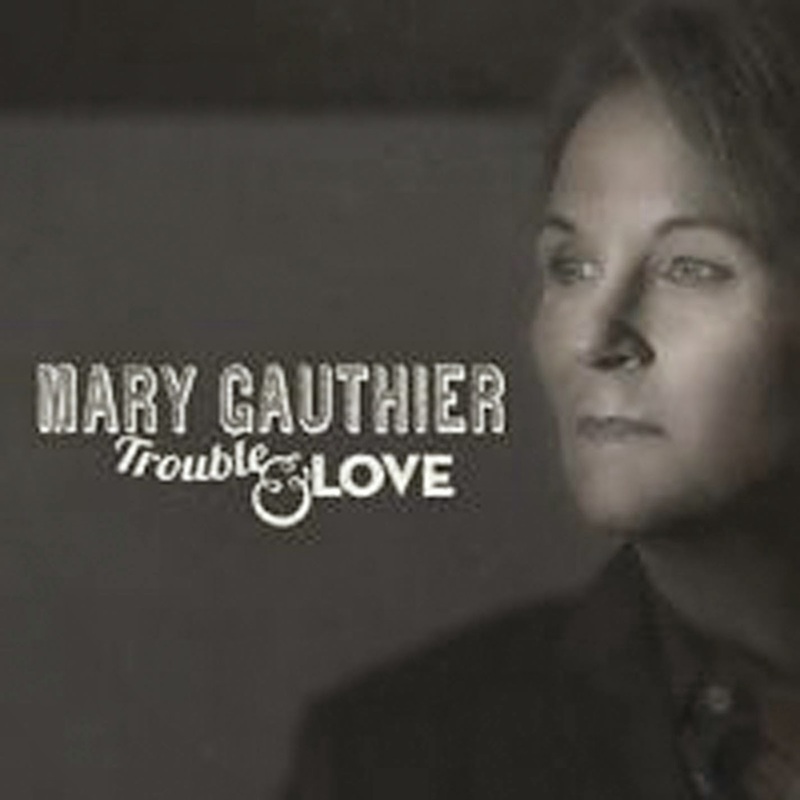 Let me say this only once, Mary Gauthier's best album is Trouble & love, released in 2014. I have no doubt whatsoever that it is only a matter of time that the rest of the world will see my way soon. You can listen to 'Another train' here. Last Saturday I had to go into town, to get something I had ordered. The weather was great. The second half of October and still t-shirt and polos all around. No need for sweaters or jackets. In other words ice cream weather. In my bag was a load of 45s that I had bought for a couple of euros. The likes of The Monkees, Mary Hopkin, The Golden Earrings, Davis Garrick, all in original sleeves. And, finally, a copy of one of my favourite oldest Stones single, 'Mother's little helper'. That one was a bit more expensive, but hey, 'Mother's little helper'! Ice cream in hand I remember something else I needed from the Saturday market, now I was there. On the way I ran into live music. A band of five teenagers was playing a Queens of the Stone Age song. Next was a cover of Taymir, a band with members that were 17 years old when they released the album last year, being covered by an even younger band. And finally, an older song, 'A forest' by The Cure. They got pretty close to the erratic original. One thing I did notice. The bass was almost as big as the player, but this kid had some pretty nice and perfectly timed melodies woven inside his serving playing. He may be someone to watch. Next the ex-drummer of the band I play in walked up to me. "These kids are better already than we ever were". I could only agree, but it's also irrelevant. Making music is about the fun of playing together. The difference starts if a band wants to get out of the rehearsal room. For these kids, I haven't a clue who they were and why they were playing on this stage; a music school band? Who knows. They played pretty good with enough left to learn. Over much of 2014 I've looked at different albums from 1968-1969. Today it's time to look at Barry Ryan, as beyond his three single hits, I've never heard a single song by Barry Ryan. The only record I could find was a compilation, so that is cheating a bit on the concept of this series, but here we go. The very best of Barry Ryan? The very best? I honestly think that that is just one song. The song that entered on the number 3 spot in the top 40 somewhere in late 1968 and climbed to the number 1 spot the week after. The song that is a mini (rock) opera, a song that I still think is so astonishingly good. A song I danced to with my baby sitting on my shoulders of which there is a picture that he is pointing to where the music is coming from in 1994. A song which is a part of me and always will be A song that each single time I hear is nothing but a joy: 'Eloise'. Barry Ryan was just 20 when the song entered the Dutch charts. A kid from around Leeds in the U.K., born as Barry Sapherston. Ryan was his mother's maiden name. His twin brother Paul wrote and produced the record. So here we have two 20 year olds who were allowed to make such a grand record. Their second single in this set up, after they split up their duo and continued as a producer/singer duo. Having produced a record like 'Eloise' there is no need to produce anything else, ever. Barry Ryan has, for several years and unnoticed comebacks from the 90s unwards, but to no avail. Everything after led to two other hits in The Netherlands, the almost as impressive 'Love is love' and 'Kitsch', a song that never did much for me and one tip in 1971. That was it. The question is, was there nothing else or just an erratic, unpredictable audience? The second single 'Love is love' was a song that I loved just as much at the time. The 'Eloise' trick is done all over again. The large orchestrated grandeur, the wall of sound and the dynamics. 10cc made a career out of some of the sounds in 'Love is love'. Just compare some passages to 'I'm not in love. A case of one on one, I'd say. After 'Love is love' there is nothing to go on for me. 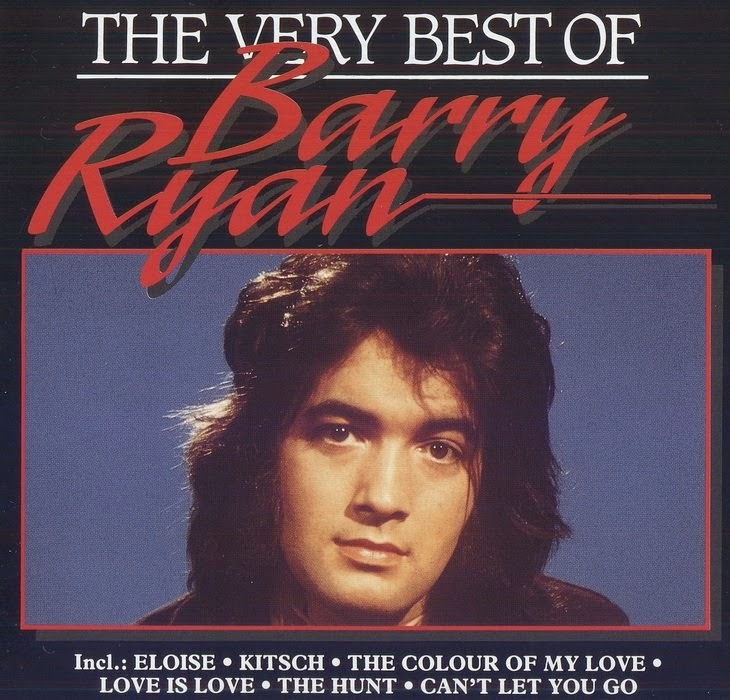 Listening to The very best of Barry Ryan it becomes clear fast that Barry Ryan also sung more normal songs. 'Loneliest night of the year' has The Beach Boys, The Beatles and Rubettes in it. The parade of instruments is still fairly large, but nothing like whole classical orchestras. This seems to go for most songs on The very best of. At first listen my impression is that Barry Ryan's voice is too large for the small songs he's singing. Too much volume but not the Tom Jones kind of volume and reach. Some songs go in that direction or in something like 'Can I get there by candlelight', David McWilliams' one hit over here. For that sort of song Barry Ryan's voice is not sensitive enough. First impressions also tells me that indeed nothing holds up to 'Eloise' and to a lesser extant 'Love is love', but then how many songs do? How many songs compare to the bombast of 'Eloise'. Hardly any, as this is the epitome of classical rock, in the literal sense. 'Alimony honey blues' is a pleasant surprise. Although it is a song that sounds familiar directly, it works for Barry Ryan. 'The hunt' (1969) is a song that incorporates several influences, but also gives away another secret. If you listen to some of the choruses there's no denying that the Ryan brothers have influenced Queen as well. With 'Can't let you go' (1971) Barry Ryan also is ahead of his days, as this is a rocking sound that comes back regularly in the years after. The kind of song that is still very much worth listening to over 40 years down the line. As such I'm surprised in a pleasant way. Not in the least by his voice, that he can use it in a different way and in a different genre as well. Could I have done without getting to know more songs by Barry Ryan? Yes, of course, but the question isn't fair. It's an addition to my musical reference. It helps me place this singer better. Having said that, no matter what I will always go back to the same song, like I'm going back to it for 46 years in a few months time. 46 Years and the song hasn't lost anything of its magic and attraction. That is what spells hit, dear reader. Het is een plaat die geen moment lijkt op de leeftijd- en soortgenoten van Ryley Walker, waarmee de jonge singer-songwriter uit Chicago zich met speels gemak weet te onderscheiden en wat mij betreft aandacht en lof afdwingt. 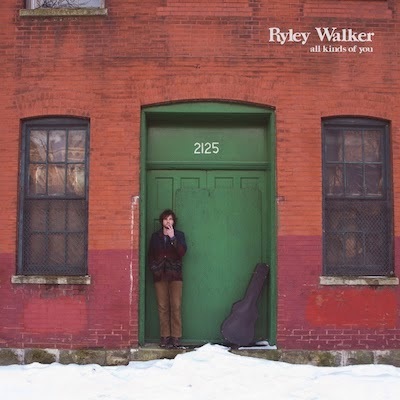 All Kinds Of You van Ryley Walker is een plaat die waarschijnlijk makkelijk vergeten wordt, maar echt niet vergeten mag worden. Dankzij Heaven heb ik hem in ieder geval te pakken en daar ben ik echt heel erg blij mee.